Home The Frisco - A Look Back at the Saint Louis-San Francisco Railway Scene showing Eads Bridge in St. Louis, Missouri with boats. 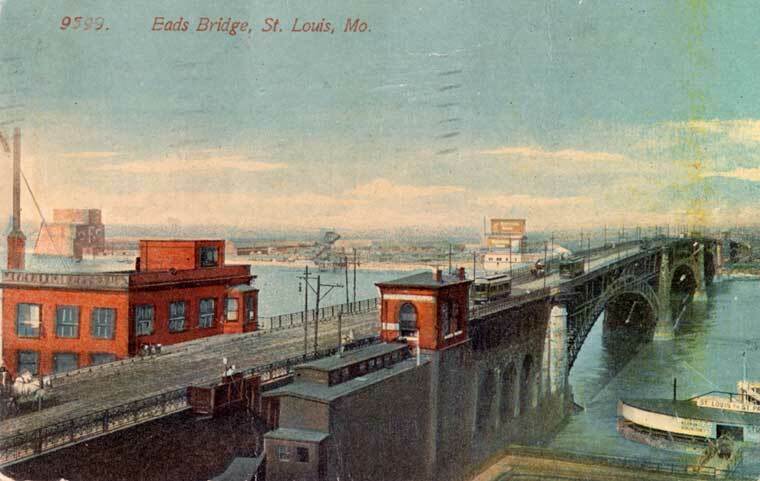 Scene showing Eads Bridge in St. Louis, Missouri with boats. Title Scene showing Eads Bridge in St. Louis, Missouri with boats. Title.Alternative 9599. Eads Bridge, St. Louis, Mo. Message Dear friends. Hope my little sweetheart is well. I bet he is almost a man now. I would just be delighted to see him. I will write later & tell you all the news. With love, Hatch & Marie Conlan. Postmark St. Louis, Mo., March (?) 1915.